Although there is time left on the clock, this is likely my final entry in the Cricut Circle National Scrapbook Day Challenges that began last week. It has been such a terrific experience; just what you would want in the Circle – inspiration, techniques, and enthusiasm. This was a recipe challenge and required a bird, bug, or butterfly, three patterned papers, the color yellow, and hand or machine or faux stitching. I made a graduation card for a friend who has just earned her MBA while working a very demanding full-time job. Now that she has her weekends back, maybe she’ll try a crafty adventure or two. 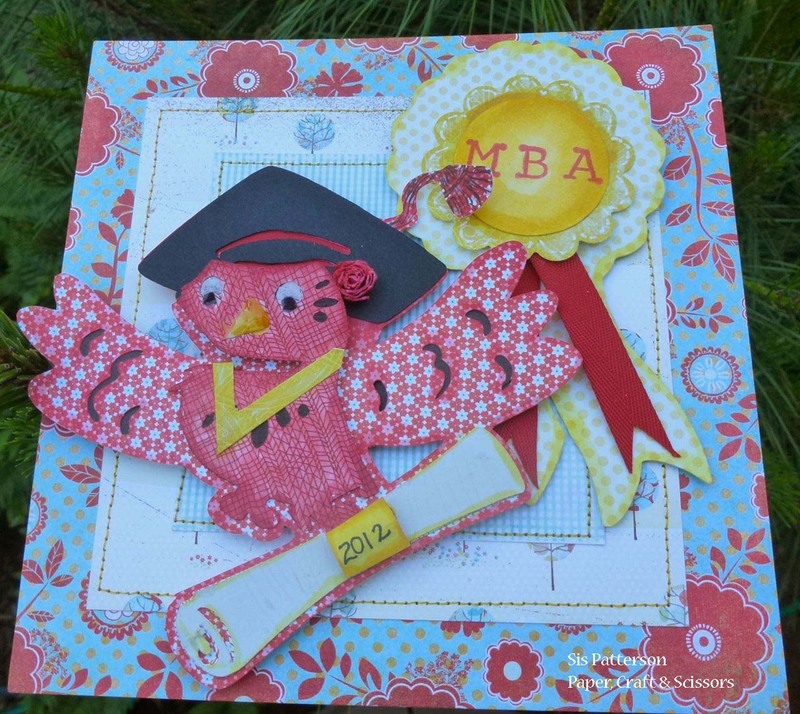 I used the Happy Graduation seasonal cartridge for the owl and the seal (with ribbon), and Cricut Craft Room Basics for the tiny rolled flower alongside her cap. I even sewed the layers of the card – got to remember to change out the needle before I sew again. It’s been a terrific week – I added a new-to-me kitty to my furry family, was selected as a winner in the Cricut Circle card challenge to welcome the new Provo Craft CEO Ashish Arora, and I won a “prize” from Sizzix for my photo of my dog and my Sizzix Vagabond hooping it up in the Where in the World is Your Vagabond entry. What a great week! Hope yours was as well. You are the master of the patterned paper! I love how you choose papers in the same color whose saturation is determined by the other colors with it—really makes a perfectly interesting combination that work so magically together! Well, you have had quite a week! Are the furry step-siblings getting along? Would love to see pictures! Congrats on the Circle and Sizzix contests! So cool! It has been such a fun week of challenges– not sure that I could pull that off again anytime soon but it was fun while it lasted!!! Sounds like you’ve had a great week. And you deserve it! Congrats on all the winnings. Love the card. Wow, what a great card, love all the detail!! Thanks for your TSG MOABH visit! Cool Card! Congrats on your wins and new furbaby!